We picked up more or less where we left off, with Cadmus having his shield hand crippled and his right leg terribly injured . . . but a quick healing potion fixed the HP loss bringing him back to 15 HP (of 18 total). We more or less kept making incremental gains, slowly eliminating some of the big hitters, and Cadmus rolling sideways to make a big hit on Bormurg, the leader/spellcaster. That was good for 15(2) cut, but he had to spend both his recently-refreshed destiny points due to the worst-timed critical fail ever. He then got nailed by a few guys from behind and a crit, knocking him down to 0 HP; he made his HT roll and fast-drew his second major healing potion, which brought him back up to 11 HP. Having enough of that, he rolled back again and changed facing. Staver nailed a nearby goon, leaving, for a change, Cadmus with only one foe. So he found himself momentarily yeti-less. Or at least yeti-limited. So that was a good thing, but then Nate reminded me that my Righteous Fury was about to run out. That’s going to leave a mark, yep. People are mainly flocking to Thumvar, as the most dangerous combatant on the board. For a brief moment, it appears Cadmus is clear of the foes . . . so he tries a backward extention (acrobatic stand), and naturally critically fails the roll. That’s like the third one this game for him. Sigh. One guy comes his way, and bashes him in the torso with something heavy, with 2 HP of blunt trauma getting through his DR 12. Staver steps up and flings two arrows at random locations on two different targets, hitting both, one in the foot and the other in the left leg. They both fall over and are incapacitated. 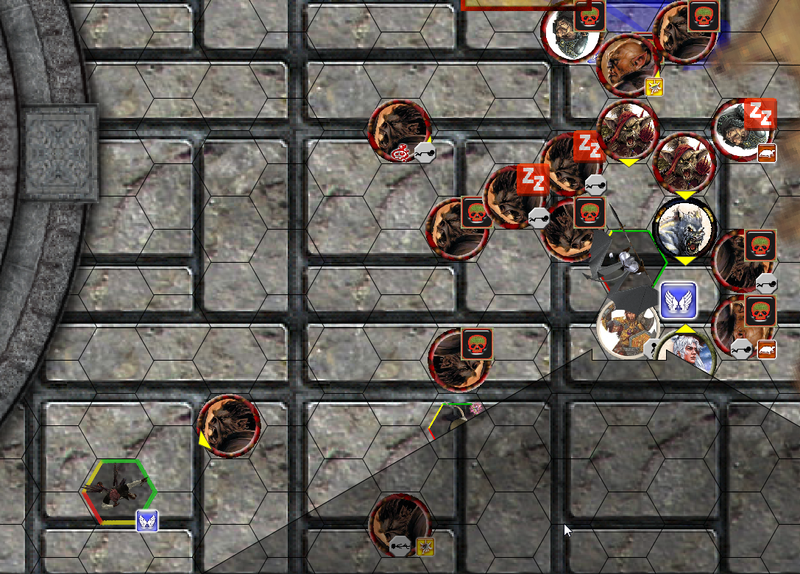 Thumvar manages a runaround and strikes a troublesome foe to the skull from above and behind, killin’ him quite dead. Cadmus’ Righteous Fury runs out, and he chooses to kneel; that’s as far as he can go, since his leg is crippled. That helps a bit, getting his penalties to be a bit lower. That’s all he can do. He’s also now at 5HP instead of 9HP, which is uncomfortably low. Hiro comes up and gives the Blessing of Hachiman to Thumvar, granting him +4 to all weapon skills for the next 10 minutes. That’s going to get ugly. Thumvar comes up and kills another with a mighty double-shot to the torso, doing enough damage to bisect the poor guy. Shiba continues to spring towards the battle. A Yeti Hunter tries to fire an arrow at Thumvar’s flank, and Thumvar’s trusty shield Returns that Missile right back at him . . . but he dodges, falling to the ground in desperation. Hiro pulls out the Breath of Fujin, an air jet spell that lands for 41 cr, double knockback, nwd. 82 knockback, and 8 blunt trauma. The bad guys continue to flail at Thumvar ineffectually. Both Shamans gesture and cast something. At Thumvar. Ah, a giant hailstorm, with 2 1d-2 crushing attacks to random locations each turn. Cadmus is nonplussed. We discuss healing, and decide that healing potions will trigger a HT roll to undue crippling, but not heal any HP of damage. HT for a basic potion, +2 and +4 for the next two strength levels. Nice rule, we think. Staver lashes out with two meteoric iron barbed bodkin arrows. He gloats . . . briefly . . . since he doesn’t recognize them as meteoric, and so ignores them. He just takes an arrow to the vitals and falls over dead. Let this be a lesson to everybody about the dangers of arrogance. Thumvar does a 2-yard flying step, gaining altitude, and does an awesomely successful double attack, including a critical success. He defends vs. the shield, but spends 3 destiny points to make Thumvar’s crit into a failure. Still, he’s defending at -9 and fails to defend. 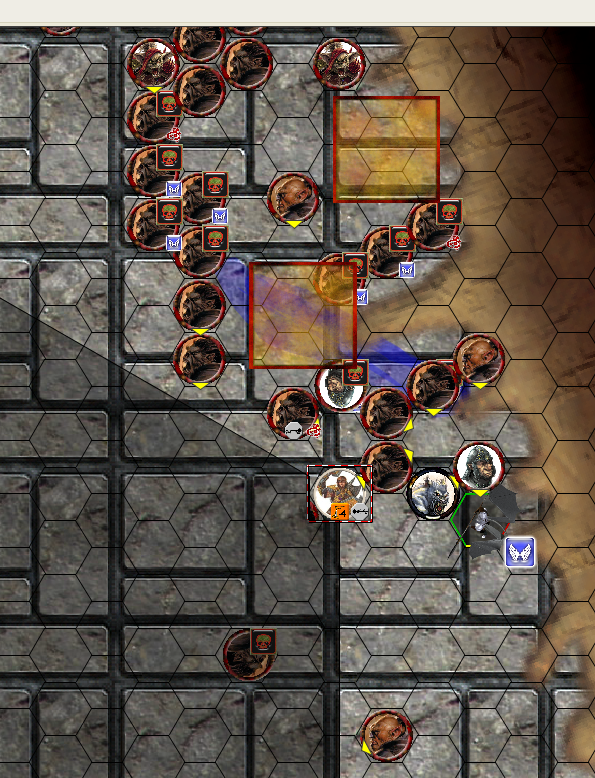 Thumvar rerolls a bad damage roll, and hits for 11 cut . . .which bites through his outer armor, and drags to a stop on something hard (really strong body hair!). Shiba repositions ready to protect Cadmus and smackdown Yeti 2, and a Yeti Hunter actually manages to throw an arrow Staver’s way that forces him to defend. He blocks. Cadmus’ turn. He uncripples his leg. Next turn he actually gets to stand up. 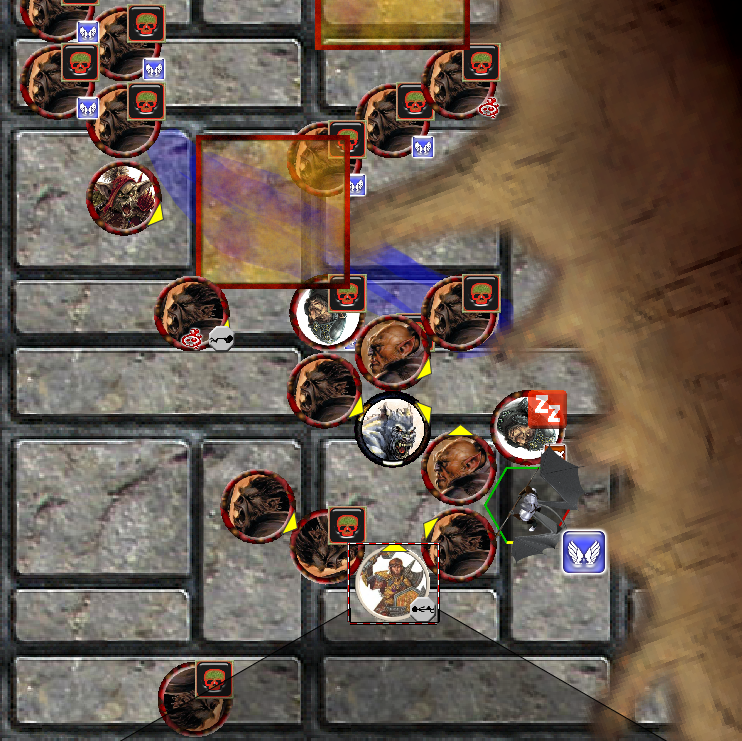 Bormurg is pissed off, and steps and swings at Shiba’s flank . . . critically succeeding, forcing Shiba to spend two destiny points to make that into a regular success. With a flail. Gets hit, no, a third Knight point turns that into a successful defense. One of the shamam’s forms wavers, ans turns into wispy airiness. This will prove his undoing, I suspect. Staver finds himself behind Bormurg, and nails him once in the vitals from the back and once in the brain, since the double-armor-divisor on the arrows. He throws back his head, and the blue light emanating from his visor streaks out of him. All of a sudden, Tatiyana, the witch we thought we killed – in fact, that STAVER killed – before, comes out of Bormurg’s dead body and streaks over to the altar. She extends her arms, and with a sudden screaming surge, a full gale-force hurricane force blizzard wind picks up. Visibility is zero. Range weapons useless (-2 per hex). And anyone flying rolls acrobatics to land, which both guys do. The guy who turned into a body of air? Whoosh. She sure looked really dead earlier, so we’re voting that she’s undead. Heh. Undead. And I thought I was going to be useless this fight. An eddy develops around Thumvar, and is -2 to all DX rolls due to the wild winds. Hiro drops to his knees, and casts a Lesser Strengthen Spirit spell which makes all of our weapons affect insubstantial. Then a lightning bolt crashes from the sky, seeking Thumvar. He dodges. A wind, freezing wind, blasts into Hiro from the side, pushing him counterclockwise. We all move steadily towards Tatiyana. She tries to strike Thumvar with lightning, Thumvar retreats towards her, avoiding the overhead lightning blast. Another roaring dust storm at Shiba, which he avoids. She casts . . . something else. Shiba runs up to her, and nails her in the foot with a telescoping blow from his sword. It knocks her down, but doesn’t shut off her spell. She throws wind and lightning at the usual suspects, doing nothing. Staver hits her with an arrow. Thumvar steps up, and triggers Tatiyana’s wait. She kicks out at him with a Deathtouch enchanted foot, but he parries. Thumvar does a nice dual-weapon attack, she tries a blocking spell to command him to drop everything, he resists despite huge penalties, and he kills her deader than hell. Now, we just have to get out of here, get the caravan to the big city, and then LOOT. Plus an upgrade. 75 points of powers. Mwa ha ha. Also, Cadmus’ DR12 on head/neck and DR9 everywhere else was routinely surpassed in this fight. There were many moments that he hit 0 HP, or slightly negative, and only the fact that I stocked up on 4 Major Healing potions (house ruled to 2d+6 HP restored, plus the modification about crippling, above) kept me both alive and in the fight. It was definitely a rough fight. I'm sorry I couldn't do more to help you (other than clear out the various archers) but encumbered Move 5 is a bit limiting in a big fight like that. Of course, if Nate approves my next upgrade, I'll have a straightline combat move of 44(! ), so that shouldn't happen again. No worries. When Cadmus doesn't have his Righteous Fury on, his encumbered move is 3 (I need to check GCA; that seems wrong) so I'm right there with you. I'm investing in an Learned Prayer (Wings of Angels) that's basically straight-up flight, which should give me a one-turn move that's appropriately good, but a two-turn move on the order of 6-14 per second, depending on how encumbrance interacts. One thing about this plan, though, is that he can't fly AND have RF on, which is something that I will need to deal with. Too bad you guys don't play 100% chat based, I'd LOVE to check out your chat logs, see how thing go mechanically and all that. Jade Regent used to play 100% chat based, but I don't think Nate ever put up the logs. I have most of them (at least for the sessions I attended) but I've never put them up anywhere. I mean, yes this was a two (four hour each) session fight, but it also had 80 mooks, 10 guys who were only slightly less powerful than the PCs, and a 750 point boss. I could use swarm rules for the mooks in the future and speed things up, but this was supposed to be a big honkin' fight. It was a capstone to being halfway through the adventure path. "A Yeti Brute takes a chop at Hiro, who fails to parry the flail, but a timely sacrificial block with Weapon Master (Shield) saves him from harm." Awesome, thanks for that Peter. Should make things a bit more dangerous for the players….